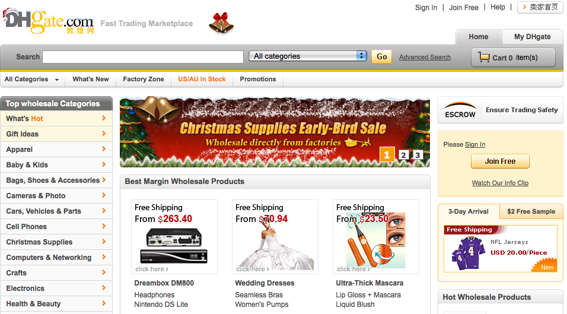 DHGate.com, screenshot of home page. DHGate.com is an online marketplace of wholesale products from China. The company is located in Beijing and Diane Wang is its founder and CEO. 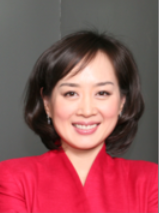 Prior to launching DHGate, she founded Joyo.com, a consumer-shopping site that Amazon purchased in 2004. She says that over a million customers use DHGate for sourcing China-made products. We asked her about DHGate and why non-China companies should buy inventory from there. PeC: Why should smaller companies, from the U.S. or elsewhere, look to source inventory directly from Chinese suppliers? Wang: “In the past, small businesses were left out [of importing products from China] because of the complexity of an outdated world trading system. “Online platforms that streamline China-sourcing help revive and rejuvenate small retailers and wholesalers, leveling the playing field between the smallest businesses and the largest. The goal of such online marketplaces is simple: Make it as easy for a small business to buy products overseas as it is for a consumer to buy a book from Amazon. PeC: How can a U.S.-based merchant know the quality of a China-made product? Wang: “As with all industries in all countries around the world, there are always cases of poor management or lack of total oversight when it comes to quality. And just like in the U.S. or Europe, when serious quality issues arise in Chinese manufacturing, regulators step to assess the situation and put appropriate safeguards in place to protect consumers. PeC: What are the best items to import from China? PeC: How can it be cheaper to buy things from halfway around the world? Wang: “One of the best things about the global economy is that it allows different countries, cities, businesses and individuals do what they do best. If you can imagine how much time and energy it would take if each household or individual had to produce all of the things they use each day—light bulbs, clothing, maybe an automobile or bicycle, the electricity to run appliances or a computer, it would be impossible for us to enjoy the quality of life we currently have. So different people do different work that they specialize in, and because they make more of the same things, they become more efficient making each item less costly to produce. “Now if you take that example of a household that tries to be entirely self-sufficient and blow it up onto the global scale, you can see that some regions might be better suited to produce certain goods. For example, countries in arid regions import foodstuff and even water. In colder areas, roses from the southern hemisphere are delivered on Valentine’s Day. Because of a large workforce and major investments by both Chinese and international sources, China has become the world’s manufacturing plant. PeC: How can a merchant know what, if any, products he or she should import from China?